If you’re considering driving outside of the USA, a good first step is to get your International Drivers License. 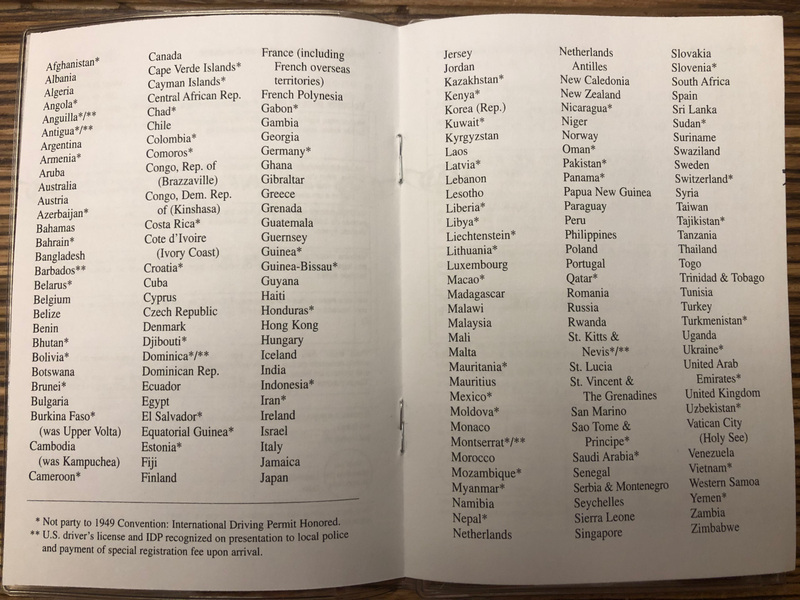 In the United States, Triple A issues an International Driving Permit, which is its equivalent, and is ‘honored’ in a long list of countries around the world. Whether you’re planning to rent a vehicle or motorbike, it’s reasonable and relatively hassle-free to obtain an International Driving Permit. The first thing you need is a valid, driver’s license from your home state/country. With this you can obtain an International Driving Permit, which is not a valid driver’s license in the United States for U.S. drivers. The International Driving Permit from AAA runs $20 and is available to licensed American drivers. It’s valid for 1 year from the day you select it to start. So you can apply for it tomorrow, yet have it start next week. International Drivers Permit from AAA. Maybe. It really depends on where you’re going and perhaps what you’re driving. Many countries will honor an American driver’s license as valid in their home country to rent a car and drive, so an International Drivers Permit will not come up. But for 20 bucks a year, it’s an affordable piece of mind for your road trip abroad. If you go to Geneva, Switzerland for example, you could rent a vehicle for you vacation without anything special besides your valid state driver’s license and a working credit card. On the flip side, if you’re looking to rent a motorbike in a place like Vietnam or Indonesia, it’s definitely a good idea to pick up an International Drivers License or Permit, depending on which is available to you. It will be easy to rent a bike without anything, however, if the police stop you, the more prepared you are the better. 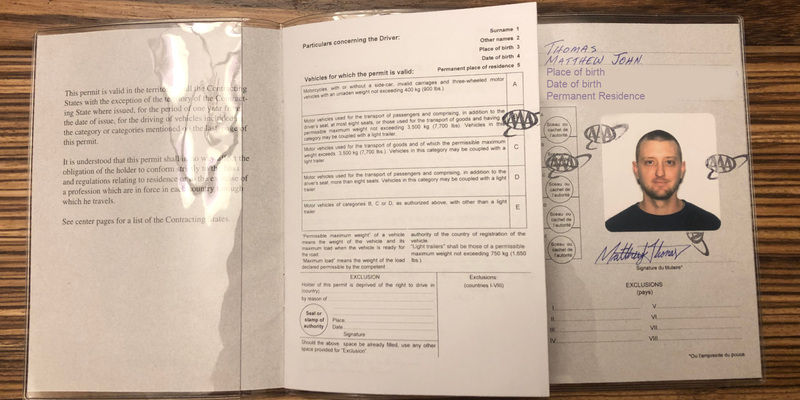 International Driving Permit – It’s a multi-page booklet type document that provides verification of your ability to drive in your home country. Most importantly, it’s written in 11 different languages. It was signed in 1949 treaty by the U.S. and other countries around the world. It’s an official form of verification in more than 150 countries. With that said, if you’re a world traveler, backpacker or digital nomad with a ‘play by ear’ style to your tours, it’s a great addition to your carry-on documents, valid for a year. Having the International Drivers Permit lets everyone know you doing your best to be legal. It’s a lot of smoke and mirrors. Having all the correct documents in order if you’re stopped will greatly reduce the chance you are asked for a bribe if you’re in a particular type of country. It could happen that the person who stops you might never have heard of your International Driving Permit, so having everything written in a number of languages allows it to be better understood. Countries that are valid for International Drivers Permit AAA. If you’re currently residing in the U.S., it should easy enough to find your local Triple AAA store. You can print out this form online in advance, or just pick it up there. It takes less than 15 minutes from the time you walk in the door. 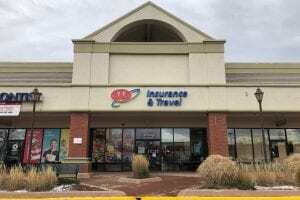 AAA store in Westminster, Colorado. If you’re already overseas, you can still apply via mail, just expect 4 to 6 weeks for return shipping, unless additional money is included to compensate for expedited shipping. Payment can be by U.S. bank check, money order or credit card with expiration date. Shipment will be via FedEx to most countries. You may use a polaroid type photograph, scanned photos are not permitted. Guidelines are same as the U.S. Passport Photo Requirements. With those 3 items, you’ll have your International Driving Permit in no time. At 27$ so far, do you splurge on the 3$ plastic sheath for your permit? Yes. It’s more official looking and classier in some plastic. And helps protect it from bends, tears and water. Triple AAA members get a tiny discount on merchandise at the store. The International Driving Permit is honored in South America, with the exception of Brazil and Uruguay. In those two countries, you must obtain the Inter-American Driving Permit (IADP). It’s applied to the same form from AAA, just check the appropriate box. What if I have a non US driver’s license because I am not a US citizen or resident? Non USA residents would go through their local authority on issuing the International Driving Permit. In England for example, you can obtain an IDP from the Post Office. 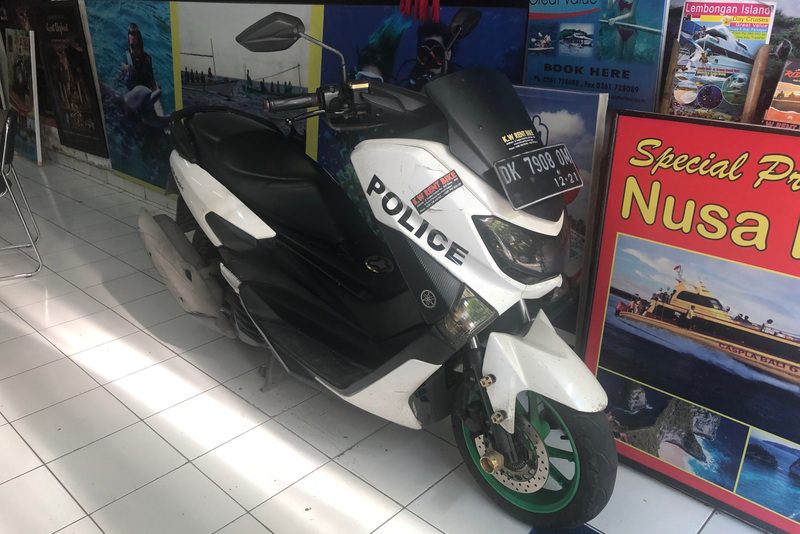 150CC motorbike for rent in Bali, ~$8 USD daily, with POLICE stickers, hmm. Now that you’re street legal, have a blast! You’ll be able to cover a lot more ground with tires doing the work. Driving legally in a foreign country is fairly similar to driving in your home country. Motor vehicles tend to operate the same way no matter. The rules may be slightly different, make sure you’re driving on the right (or left) side of the road, whatever’s right. When in doubt, drive slow and safe. Your Valid Home Country Driver’s License. Proof of vehicle ownership (comes with vehicle rental, blue card in Vietnam). Tiny amount of money (the rest hidden). Speak little as possible if stopped. Drive it like you stole it, is not something we recommend doing. Drive slow and abide by the traffic laws. Drive the speed limit, don’t speed. It’s the most likely reason why they get ya. Not all places give you a few klicks or miles per hour over the legal limit. Enjoy the journey. This is for those going too far under the limit. Have fun take chances. Expect to get stopped. Be prepared with all your documents ready. Wear a helmet on a bike and wear your seatbelt in the car. Make sure you have the right vehicle for your travels: snow, 4×4, rain, kids, automatic vs. manual, etc. Have your cell phone charged and a downloaded offline (Google) map handy, paper map too only for backup. Keep the gas tank filled. Keep it above half full just in case. Tell somebody where you are going and when you will return. Map out your route in advance and read over the directions. Download the country’s Google Maps to your phone, so you can view without WiFi and use GPS still. 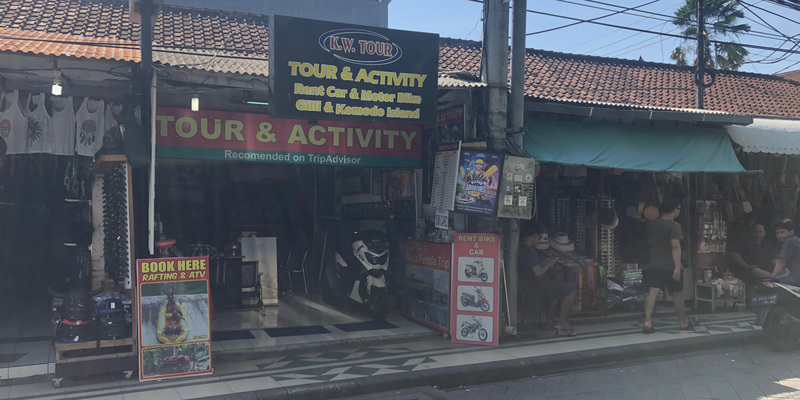 Rent a car or motorbike in Bali to better see the island. Now that you’re equipped with an International Drivers Permit or License, along with a valid drivers license from your home country, you are good to go and drive legally in more than a fifty countries around the world. Bon Voyage and Safe Travels! !